Sleep soundly again without your CPAP mask getting in the way! Want it delivered by Saturday, 20th Apr? Order within and choose Special Delivery at the checkout. Sleep apnoea affects a growing number of people and can have various causes. It can be a relief to get a diagnosis and know the reason for your troubled sleep, but it’s also scary to know that you are often not breathing during the night. Many people treat their sleep apnoea with a CPAP machine. These pumps are fantastically effective for helping you to breathe, but can unfortunately make sleeping very uncomfortable. If you like to sleep on your side, then having to wear a CPAP mask is hugely annoying! Luckily Natural Health Supports have come up with a special CPAP pillow for side sleepers. This pillow features a special indentation that will give you room for your mask and tube, allowing you to sleep soundly again. Not only this – it also has all the other posture and comfort benefits of the standard Side Sleeper, so you’ll get the best sleep of your life! Experts recommend sleeping on your side – Side Sleeper makes it easy! Many people find it most comfortable to sleep on their sides, and this is backed up by sleep specialists. When you sleep in this position you are more likely to sleep soundly and uninterrupted, with your spine properly supported. However, this is only if you are in the proper posture! It is easy to end up hunched over when you sleep on your side, straining your neck and back in a way that has lasting repercussions. 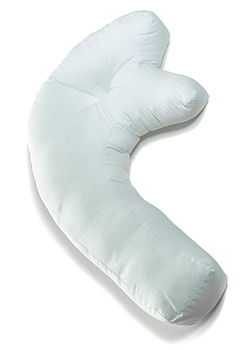 The Side Sleeper pillow is uniquely designed to support your head, neck and back for the best possible sleeping experience. When you lie down on the Side Sleeper, you’ll feel instantly supported and cushioned in a way that feels absolutely heavenly. The ear well means that your head can be perfectly supported by the top of the pillow, keeping your chin level to open your airways and make breathing easy. Your neck will be at the optimum angle to avoid strain, while the long tail of the pillow runs down your back and keeps your posture straight and strong in a way that is entirely comfortable and natural feeling. No more snoring, overheating, ear pressure or allergies disrupting your sleep! The Side Sleeper has been thoroughly designed to make your sleep as perfect as possible. The way that it positions your neck to open your airways doesn’t just make breathing easy, it will prevent you from snoring for a beater night’s sleep for both you and anyone next to you! The ear well reduces pressure on your ear canal, preventing any annoying clicking, popping or fullness that you might normally experience. The hollow fibre filling of the Side Sleeper is hypoallergenic so it’s perfect for people with sensitive skin or sinuses. It’s machine washable so you can easily keep it clear of dust and other aggravating particles. The material allows air to circulate, wicking away any moisture or sweat that starts to build up in the night and keeping you at the perfect temperature. This is an absolute godsend if you’re regularly kept awake by overheating or night sweats! What are you waiting for? Say goodbye to restless nights and swap your saggy old pillow for a SideSleeper with magnets for pain-free, gloriously deep sleep that you can rely on. If you're not 100% happy with your purchase and you have not opened or used any of the intimate products, and everything is in an un-opened, re-saleable condition, you can return them for FREE within 14 days of delivery to get a full refund. If not faulty, for hygiene reasons some items such as pillows, bedding and underwear etc. cannot be returned unless it is faulty, you can find the full list of excluded products here. If you have any questions about our products, please pick up the phone and speak to a member of our Customer Care team. Our team have over 10 years of customer service experience, helping you make the best decision when it comes to your health. Call us on 01482 496 931. Our Customer Care line is open 8.00am - 6.00pm GMT, Monday to Friday, 9.00am - 5.00pm GMT, Saturday. If phone calls aren't for you, visit our contact us page to use our contact us form, email or live chat which is also available on our website 8.00am - 6.00pm GMT, Monday to Friday, 9.00am - 3.00pm GMT, Saturday.